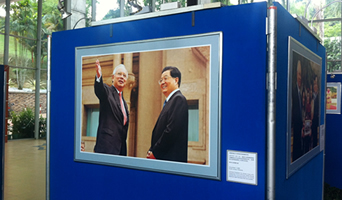 BANGI, 19 June 2012- Rare photographs depicting developments in diplomatic relations between Malaysia and China are on display in the Chancellory building here from today. 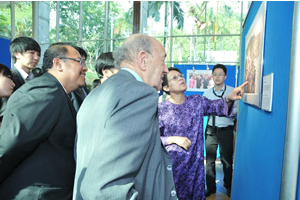 The exhibition organised by Xin Hua News Agency with the cooperation of the Malaysian Association of Chinese Students and The National University of Malaysia (UKM) is to commemorate 38 years of diplomatic ties between the two countries. The photographs include, a picture of the late Chinese leader Chairman Mao Zedong meeting Malaysia’s second Prime Minister, Tun Abdul Razak Hussein when he visited China for the first time in 1970’s. Vice Chancellor, Prof Tan Sri Dato’ Wira Dr Sharifah Hapsah Syed Hasan Shahabudin said since 1974 when Malaysia established diplomatic ties with China, the relationship has continued to grow from strength to strength as both countries seek to enhance their ties and trade relationship. Opening the exhibition today, she said UKM currently housed more than 120 students from China and is planning to recruit more students from there. 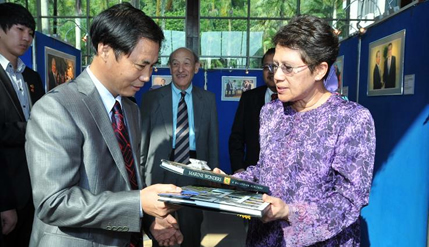 Apart from the growing trade relationship, China is one of five countries in the world where the Malaysian Government has endowed a Chair of Malay Studies. A further demonstration of the close bond between Malaysia and China are the two pandas which will be on loan by China to be placed in the Wetlands Park in Putrajaya as a symbol of the strong diplomatic ties between the two countries. 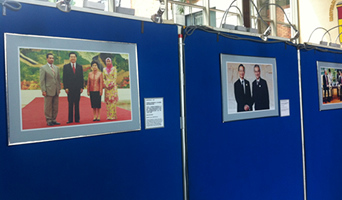 The strong diplomatic ties and deep friendship bonds are firmly documented and captured on photographs being displayed at the exhibition. 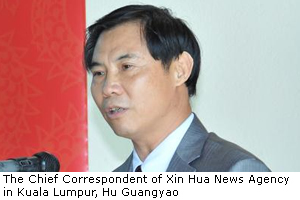 The Chief Correspondent of Xin Hua News Agency in Kuala Lumpur, Hu Guangyao said friendship between the two countries can be traced back to over 600 years ago when Zheng He was ordered by the then Chinese Emperor to act as an envoy to the “west seas” where Malaysia was then seen as the centre. After Zheng He’s voyages, exchanges between Malaysia and China have been on the increase. He said various events were being planned to enhance relationships between the two countries and was confident that the friendship will continue to grow and strengthen. Director of Alummi Relations office, Prof Dato Dr. Laily Din said UKM can act as a catalyst to facilitate collaborations and to strengthen the ties through its Alumni. Present at the opening ceremony was Prof Ezra Vogel from Harvard University, Mr Huang Bin, President of the Malaysian Association of China Students Alumni (MACSA), Directors of Institutes, Head of Departments, lecturers and students.